Our school uniform is blue sweatshirts and cardigans with yellow polo shirts. 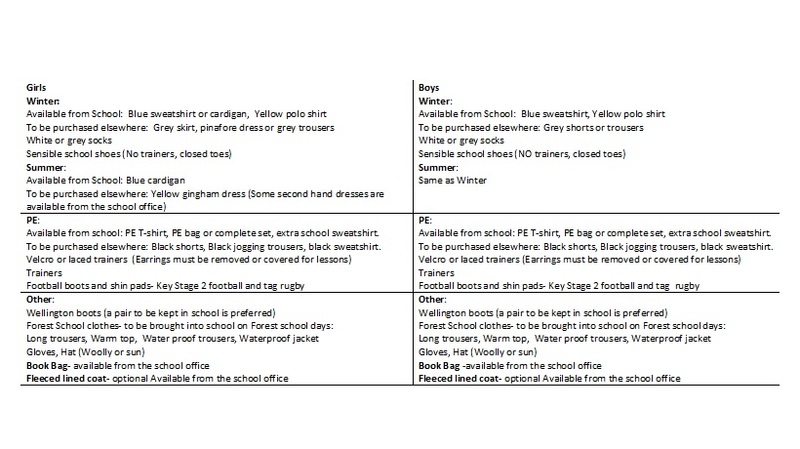 Most garments can be purchased or ordered through the school office; along with book bags and PE bags. Please note: black trousers/skirts and white polo shirts have been phased out and no longer school uniform. Available from school: PE T-shirt, PE bag or complete set, extra school sweatshirt. To be purchased elsewhere: Black shorts, Black jogging trousers, black sweatshirt. All children will need to bring a coat to school because they will be expected to go outside when the weather is cold and sometimes a little wet. Children may go on the field at playtimes during the winter months if they have Wellies to wear. Please ensure that all uniform is labelled with your child’s name so that lost items can be returned.